We've touched on cryptocurrency mining in the past as well run some benchmarks, but one thing we haven't really covered is dedicated mining hardware. The most important part of any mining setup are the graphics cards since they perform the actual computations. With traditional hardware, you need a separate motherboard, CPU, hard drive, and RAM for every 4-6 graphics cards. This can get expensive and is really a waste of good hardware since mining with many GPUs doesn't come close to bottlenecking a modern system. But what if you could plug a bunch of graphics cards into the same motherboard and you only needed a single CPU to power all of them? That is the problem Asus' B250 Mining Expert motherboard is trying to solve. Rather than the standard 7 PCIe slots on a typical ATX motherboard, they have gone all out with nearly triple that number. The new board has support for up to nineteen (19) graphics cards on one motherboard. There is a single 16x slot and 18 additional 1x slots. Crazy stuff. In order to fit all of these, you'll need an open air case with rails to mount your graphics cards to. You'll also need a few dozen PCIe extension cables, preferably the USB variety, to connect your bounty of GPUs. To power this monster setup, the B250 Mining Expert comes with triple 24-pin ATX power connections as well as three additional Molex power inputs near the graphics cards. 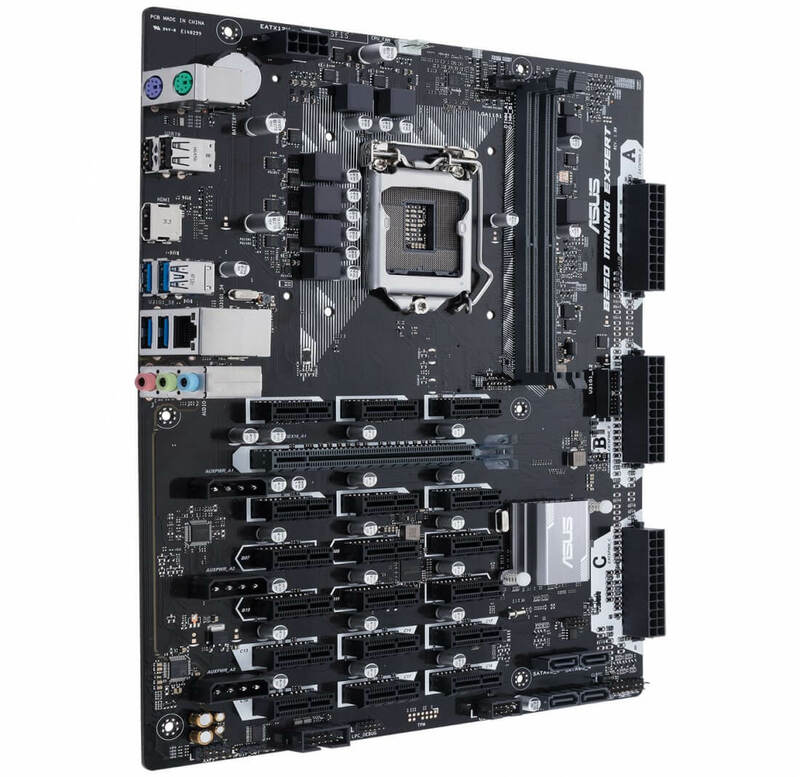 Other specs rounding up the B250 Mining Expert include an LGA1151 socket, two DDR4 slots, voltage stabilization capacitors at each PCIe slot, and a specially tuned BIOS for mining. For the time being, users will only be able to utilize up to 16 GPUs at once due to a driver limitation. For users that want the full 16 cards, they will need to use 8 from AMD and 8 from Nvidia. However AMD is scheduled to launch a new driver later this year that would allow all 19 GPUs.